We, Axcel Gases along with our associated companies are a renowned Carbon monoxide gas manufacturer, supplier and exporters In India. Carbon Mono oxide is a highly toxic, colorless, odorless and tasteless gas. It is highly poisonous for living beings when it is present in atmosphere by more than 35-40 PPM. Carbon Mono Oxide is mainly generated when the combustion of carbon in air of high temperature takes place. Also when there is combustion taking place in a closed chamber or in a room where enough Oxygen is not present to convert the carbon contents in CO2, at that time Carbon Mono Oxide gets generated. This gas is collected in Carbon Mono oxide Gas Cylinders and supplied to diverse industries / laboratories for their respective use. Carbon Mono oxide is available in different purity grades and concentrations to meet the specific requirement of diverse industries. We have in house laboratory equipments to check the level of purity as well as concentrations. Various measures have been adopted to check the emission of Carbon Mono oxide in atmosphere. For this purpose, one of the major use of Carbon Mono Oxide is to calibrate instruments which tell us about its presence in Air / atmosphere / confined space. Carbon Mono oxide is also used for productions of various chemicals of industrial use. In Laboratory or research centers to check and control the CO contents in vehicle engine emission. In Laboratory or research centers of oil industry to check and control the CO content in particular oil or gas. In Industries to make Aldehydes. In Industries to make Phosgene. In Industries to make Methanol. In Food Industry for Meat Processing / colouring. These are some of the common uses of Carbon monoxide. 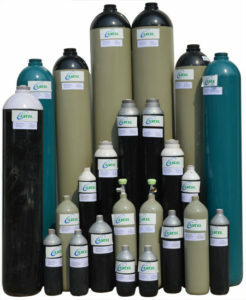 There are various other ways in which this gas can be used in a particular industry or process.